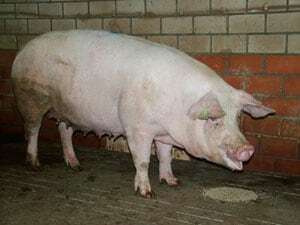 Dutch Landrace Pigs are a combination of German Landrace and Danish Landrace pigs. They are found in the southern, eastern, and northern parts of Holland. They are a meaty and efficient breed of pig. Dutch Landrace pigs have the same general look as other Landrace breeds. They are white and they have large floppy ears. They have been developed to have bigger backs and heavier hams than found on other types of Landrace pigs. They are also very fertile and are very good mothers. The swine pig ranchers of Holland lay great stress on production detail. Ninety percent of the marketed pigs are crossbreds, but careful attention is given to seed stock. Over 1,000 Dutch Landrace litters are tested each year for weight and other characteristics. Dutch Landrace pigs have proven to be not just valuable to the swine industry of that Holland, but they have been exported to other countries as well, mainly Japan and Spain.